I'm after one of your books "Quilts for Peaceful Moments". I have purchased your book "Turning 20 just got Better" and anxious to get started on a quilt out of it. 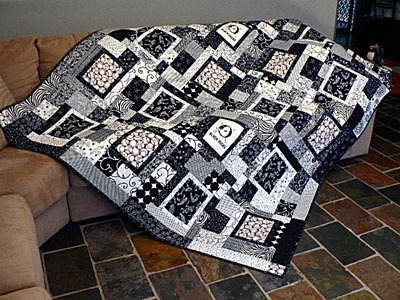 I have enclosed a photo of a quilt I made out of "Turning 20 Around the Block " It was for my son's 30th birthday in June 2010. He is a baseball player with club colors of black & white . The team emblem is the "Black Ducks". I used the "sunbonnet sue " layout & just quilted in the ditch . He was absolutely thrilled with it as I was. Love your books.